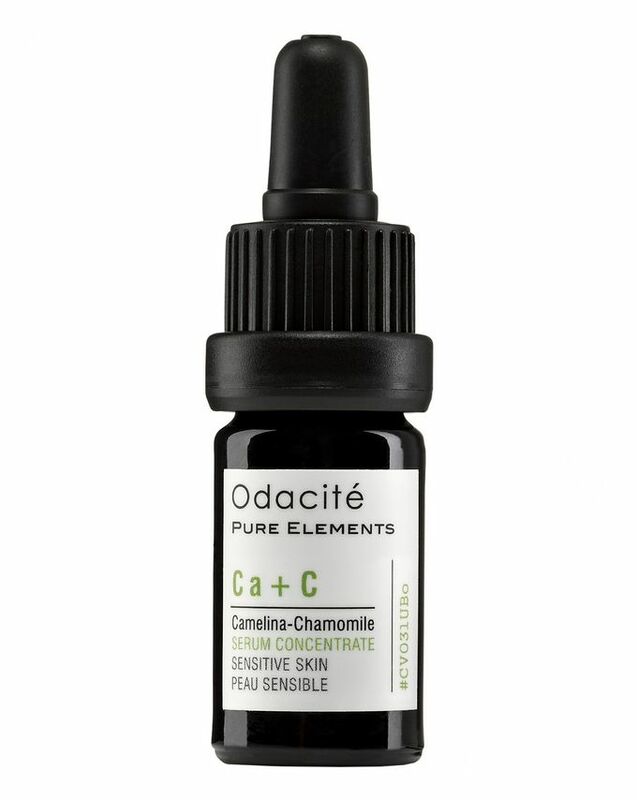 Soothing, calming and strengthening, Odacité’s Sensitive Skin Serum Concentrate is suitable for even the most easily upset complexions; counteracting redness and irritation, to leave you face smooth, supple and contented. Camelina oil possesses incredibly powerful anti-inflammatory properties, to relieve signs of stress and help condition angry or reactive skin – even those suffering from dry skin conditions such as eczema and psoriasis – while chamomile and calendula combine to help heal and accelerate repair, whilst minimising redness and diminishing discomfort. The perfect supplement for skin susceptible to flare-ups, this potent elixir can be blended with your favourite daily hydrator, or applied directly to slightly damp skin post-cleansing, to help re-train your face to be less angry and tempestuous. Combine with Fragile Capillaries Serum Concentrate, to help tackle rosacea and broken veins, which often go hand-in-hand with sensitivity. I really struggled to balance my skin last year - following periods of stress/illness my skin was awful and this serum has made such a difference. Before I started using it I had dry, inflamed, eczema-prone skin on my cheeks, combined with blocked pores and adult acne on my forehead and nose. It was awful. Within two weeks of using this serum, my skin completely cleared up: it is no longer dry and have no spots at all, and more importantly, it has remained healthy, clear and balanced months on! I have never reviewed anything on this website before but thought I would share my experience with this product. I use two drops in the morning and one at night and a bottle lasts me around 3-4 months. So I NEVER leave reviews (as I never can be bothered) but with this, I just felt I had to. My skin is normally a joke - really oily and dehydrated, really sensitive, acne prone - a bag of fun really. However, I got this in a little sample form, after repurchasing my oskia products and added a little drop to my Clinique gel moisturiser. I had just been suffering from my skin having a complete winter freak out - I had gone home for Xmas and the change from hard to soft water, made my skin have some ridiculous red, flakey and itchy patches. I woke up the next morning after using this and they had completely gone. I didn’t get my hopes up too much, as I just thought it’d been pure luck, but continued to use the oil. The next day, my skin had COMPLETELY cleared up which is an absolute rarity for me and the dry patch I’ve had on my chin since October (dear winter, I hate you) had GONE. I can only put it down on this product, as this is the only thing I have changed/added to my routine. I am now obsessed and will NEVER be without it. AMAZING. I usually use this at night, mixing this in my moisturiser. It works to calm my sensitive skin down, but I have tried other products that works the same but at half the price (with a larger quantity). My skin on my cheeks get very dry and irritated (probably undiagnosed eczema) and sometimes burns when I use other products. Then I started using this serum before bed and mixed with my moisturizer in the morning. Three weeks later, and my skin has healed completely! Of course, this morning I spilled a nearly full container all over the bathroom floor, so I'm ordering it again. Otherwise, I think a whole bottle will last me at least 6 months, as a little goes a very long way. Absolutely my go-to product for sensitive skin now! This is one of those products that smells great, looks good on the shelf and is nice to apply but I am not sure it'a actually doing anything great for my skin. I haven't broken out or anything but I'm not sure I'll be purchasing it again. I like this product. The smell isn't as bad as the one for hydrating the skin but not that pleasing to me as I would like and it doesn't leave skin greasy or sticky i.e it. sinks in very nicely. Though, I don't feel like it does that much for my skin at all. It is nice but too expensive to repurchase for not doing anything for me.